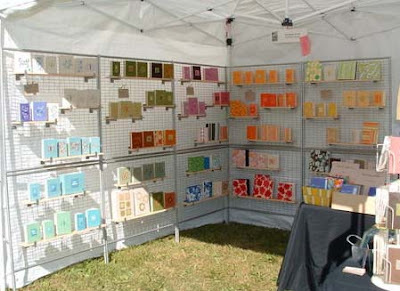 It is prime season for craft shows and many members of BEST are taking their books and other creations on tour to sell at the craft markets around the globe. 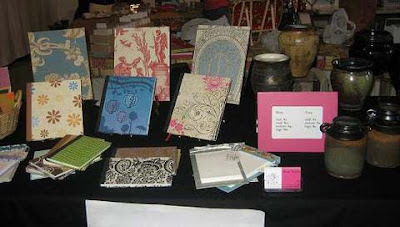 Since it can be very difficult to display handmade books and show them off effectively some of the BEST members have been sharing ideas and photographs to help each other with their upcoming shows. 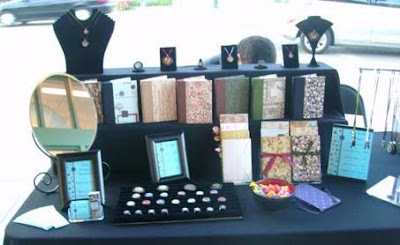 Clearly the size of your space makes a big difference when you are planning a display. Having a whole corner like JennysBooks and Stacyhandmade shown here, allows for some extensive and creative shelving, all looks great. The smaller spaces require even more creativity to fit your work nicely together so everything can be seen and shown off nicely. Having some height to the display and keeping lots of books upright is certainly a common element here. And they all look amazing! these displays look so beautiful! i am drooling over those leaning stands!